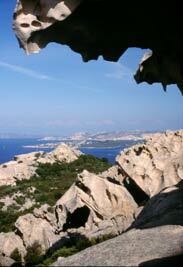 Mysterious and isolated, Sardinia has been inhabited since the Neolithic Age. Phoenician, Greek, Arab, Spanish, and French invaders have come and gone, marking the local language, customs, and cuisine. The mountainous inland terrain is home to wild animals (boar, mountain goat, hare, and more) which are transformed into succulent pasta sauces, stews, and roasts. 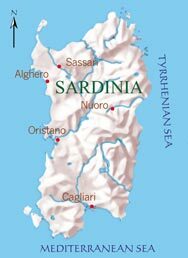 Lamb, the island's favorite meat, is often cooked in the company of wild fennel, and sheep's milk cheese appears at nearly every Sardinian meal. 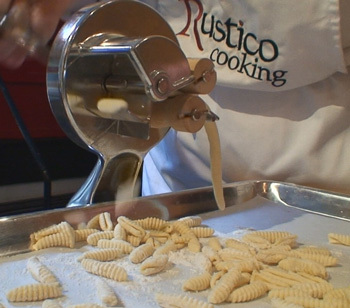 Making maccheroni al ferretto is a time-honored tradition in Sardinia; it takes some practice to shape the small bits of semolina dough around a knitting needle, but the result is a chewy, delicious pasta that absorbs sauce splendidly. If you don't have time to make it from scratch, you can find dried busiati (as the pasta is called in Sicily) in specialty markets. Make the maccheroni: Place the semolina flour on a counter. Make a well in the center and break the eggs into the well. Using your fingertips, beat the eggs, then drag the flour into the eggs little by little. Add a bit of cool water as needed to create a firm dough that holds together. Knead the dough for 5 to 10 minutes, or until it is smooth and satiny and no longer grainy. The dough should be firm, or else it will not slip off the knitting needle when you shape the maccheroni. Cover the dough with plastic wrap while you work. Cut off a small piece of dough, keeping the rest covered, and snip it into hazelnut-sized pieces. Roll each piece into a thin log between your palms, then place each log on the counter. Press a knitting needle (about 2 mm diameter) on top of each log and put your hand on top of the knitting needle, directly above the log. Roll back and forth on the counter until the log thins out into a long, hollow spaghetto about 2 inches long; it may take some practice, but eventually you will get the feel for it. Slip off each maccherone as you shape it and place on a parchment paper-lined tray; dust the maccheroni with semolina once in a while to prevent sticking. 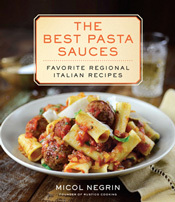 Make the ragu: Place the olive oil, onion, garlic, and parsely in a saucepan large enough to accommodate the pasta later. Cook over medium heat until the onion releases its aroma and wilts, about 10 minutes. Add the pork and cook, stirring often to break it into tiny pieces, about 10 minutes; the pork should look rich and brown and all the water in the pan should have evaporated. Pour in the wine and cook, scraping the bottom of the pan, for 5 minutes, or until the wine evaporates. Stir in the tomatoes, bay leaf, water, salt, and pepper. Cover and lower the heat to a gentle simmer and cook, covered, for 1 hour. Be sure that there is always some liquid in the pan. Taste for seasoning, and adjust as needed. Keep warm. Cook the pasta: Bring 5 quarts of water to a boil. Add the maccheroni al ferretto and salt, and cook until al dente, about 8 minutes; drain, reserving 1 cup of the pasta cooking water. 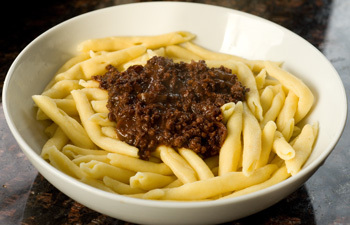 Toss the maccheroni with the ragu and stir in as much of the reserved pasta cooking water as needed to dilute the sauce to a coating consistency. Malloreddus are a small, oblong, grooved Sardinian pasta reminiscent of gnocchi. They are made of semolina flour and water (at times a bit of saffron is added), and take longer than most dried pastas to cook; 15 to 20 minutes is the norm. If you can't find malloreddus (they are also called gnocchetti sardi), or Sardinian gnocchi, opt for cavatelli (pictured here) instead. Bring 5 quarts of water to a boil. Add the malloreddus and salt, and cook until al dente; drain, reserving 1/2 cup of the pasta cooking water. Meanwhile, beat the Ricotta, Pecorino, and pepper until smooth in a bowl. Cook the sausage in a 12-inch skillet over medium-high heat until browned lightly and cooked through, about 8 minutes. Stir in the garlic and cook 30 seconds. 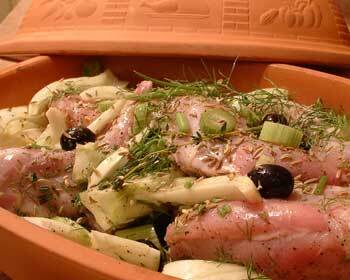 This succulent main course is equally delicious when rabbit is substituted for the chicken. Serve with roasted potatoes or crusty bread to mop up the delicious cooking juices. Combine the chicken pieces, fennel wedges and fronds, garlic, olives, fennel seeds, chili, pepper, wine, and olive oil in a 10- x 14-inch roasting pan. Refrigerate for 2 to 48 hours, tossing once in a while.